I have insomnia. I have had it for a long while. Recently the only way I have managed to get to sleep is to imagine a world where we have won the plebiscite, and the parties that failed to secure individual majorities have successfully combined into a coalition that prevents Stephen Harper from continuing his disastrous reign. My partner tells me I am dreaming in technicolour. I can deal with the No campaign appealing to the anti tax, right wing crowd. I would expect no more. What has hurt are the numbers of people who say they are voting No on principles that we share, like equality. That they are voting No for all sorts of Good Reasons. They have not, they say, been swayed by the outright lies perpetrated by the CTF which only now are being authoritatively tackled by those traduced by them. Rather they object to the Really Important Issues. Like the impact of a regressive tax on poor people, or the thoroughly unsatisfactory governance of our transit system and its lack of accountability to the people of this region. That rejecting a sales tax is more important than getting more HandyDART service – as though that were – somehow – a bribe. The only one clear message all these heartfelt no votes can truly claim is: I cannot bring myself to support the only proposal on the table, backed by municipal, regional and provincial governments, endorsed by 130-plus organizations from all walks of life, that – in spite of its inevitable flaws – is guaranteed to strengthen the economy, spread costs evenly, clean up the air and save lives, reduce spending on costly automobile infrastructure and subsidies, improve social equity, reduce public health costs, give employers access to a wider range of employees, give tens of thousands of households a chance to save $10,000 a year in automobile expenses, speed up goods movement, and reduce congestion and commuting times. But rather like last weekend’s Pete McMartin column just a little bit too late, I fear. The time to submit your votes stretches out before us, but I have a worry that the convinced have already committed themselves – not that they were open to any suasion. They had already made up their minds, and cannot conceive of any circumstances that would persuade them otherwise. And the people who might be swayed don’t actually vote these days. Their ballot has probably been recycled, or simply lost. Or they never bothered to register and anyway they haven’t got a driver’s license. So this is now the time for the Hail Mary pass. A ball tossed high in the air in the hopes that someone near the goal line might actually reach it in time. And we could still, maybe, squeak out a win. If you are reading this you are mostly likely someone who has already voted. So this is not addressed to you. This is aimed at those who care enough to register, who got their ballots only recently and have not yet made up their minds. Or who could still register, and vote, if only they can summon up the will to try and make a difference. Because that is where we are. More of the same, only getting steadily worse as we try to find another way forward. or something better. Something we had a glimpse of in 2010, but which seems to have slipped our grasp. A place where owning a car and driving for everything, no matter what, does not define us. Where walking, cycling and taking transit are realistic options. Where society actually does exist. Where “me first” is not an acceptable justification for anything. It’s huge. Eight lanes wide, it was the only bridge in the region which was never associated with congestion. Until the even wider Port Mann opened. There have recently been some proposals to dedicate the centre lanes of the bridge to a linear park. There is much talk in urban circles of finding similar linear structures to the High Line capable of being converted into public space. In Vancouver, that has centered around the Georgia and Dunsmuir Viaducts. Which in my view should simply be removed altogether to create a new development opportunity. 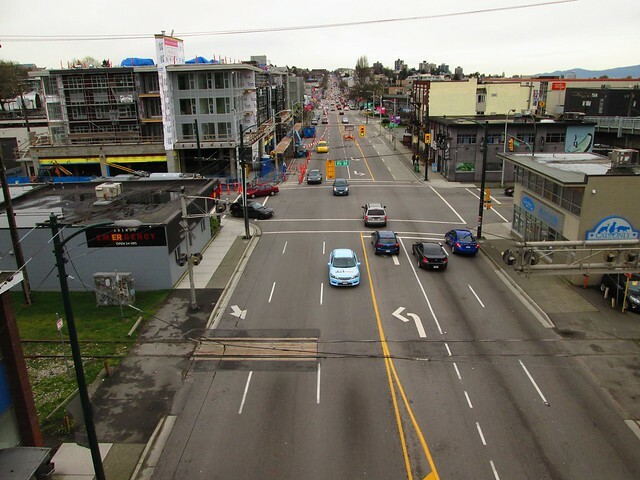 On the Granville Bridge people have been suggesting a new pedestrian area in the centre lanes. This seems to me to be even sillier than the viaduct idea. If I am going to walk over a bridge, I want to see what I am crossing over not three lanes of traffic on either side. And no doubt a pair of solid, unclimbable safety barriers too. This set is of the views from the Fir Street off ramp, where there is a sidewalk on the west side, overlooking Kits and Granville Island. An elevator directly down to the Island would be good too. In the foreground the CP railway (Arbutus Line) crossing and then the other Granville Bridge off ramp to 4th Ave. That’s West Van in the distance. The High Line in New York is actually midblock – it threads itself in between buildings, which used to be the factories and warehouses it serves. So neither this bridge nor the viaducts will work in quite the same way. But they do provide a view down the streets – sorry Avenues in our case – they cross. Much quieter than the streets of Lower Manhattan. Just as the High Line there are good views off to the distance. And I happen to think the Burrard Inlet is a lot more picturesque than the Hudson River, but your view may be different. 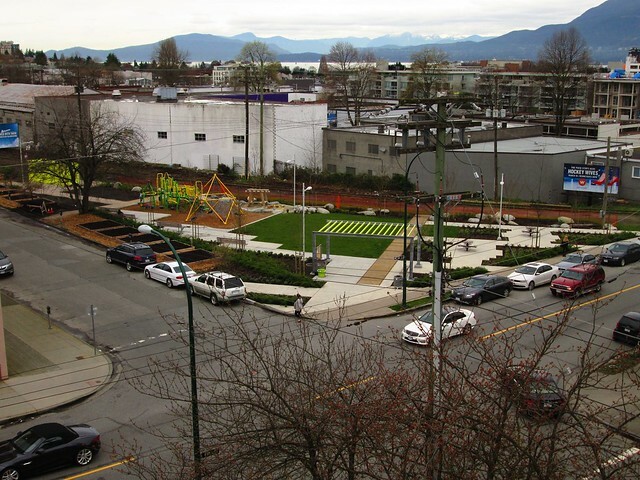 The playground is a very happy addition to this corner site. 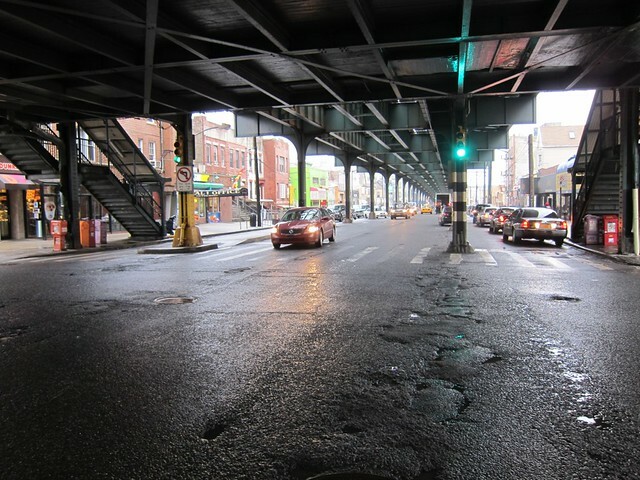 Count them – six lanes – on West 4th Avenue. That makes it a stroad: a major arterial road and a shopping street. 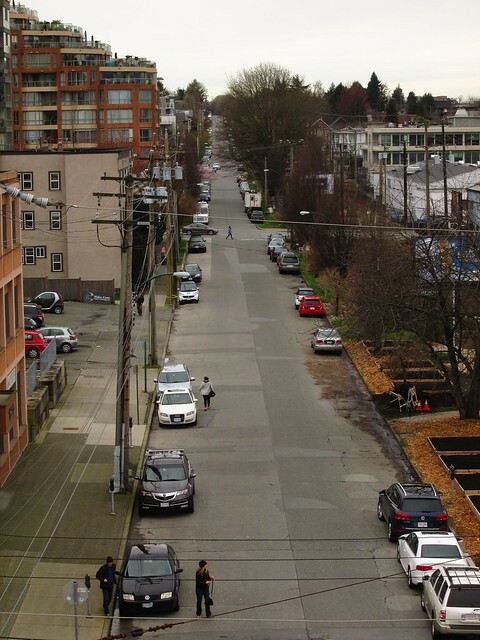 I would suggest that it is a candidate for traffic calming – or maybe bus lanes for the #4, #7, #44 and #84 – but of course that would set off the same outrage we had to weather from the Point Grey Road changes. Which of course have not actually lead to the decline of Western civilization as we know it. At one time the CP track along Lamey’s Mill Road went through here, crossed the road at an oblique angle and then swung right up towards Burrard. But then Starbucks was built which in some people’s mind ended the possibility of reopening the Arbutus Line for trams, which would connect with the now abandoned Olympic Line. But the old Sockeye Special did not come through here. That line crossed False Creek at an angle on a long gone trestle. Anyway there’s a better alternative: I will get to that in a bit. The Fir Street ramp leaves the main bridge around here. 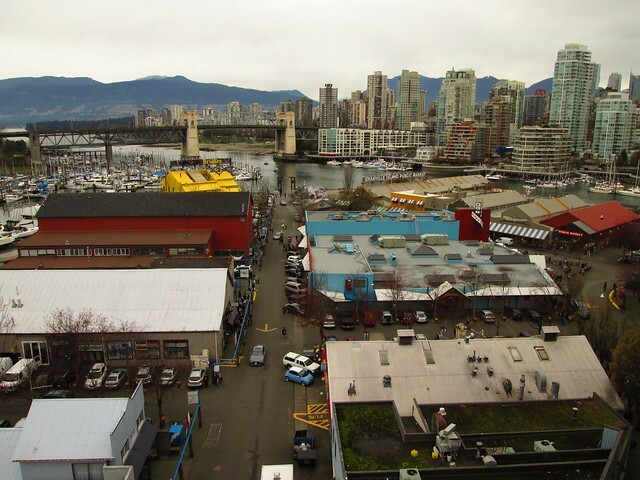 Granville Island is immediately below. 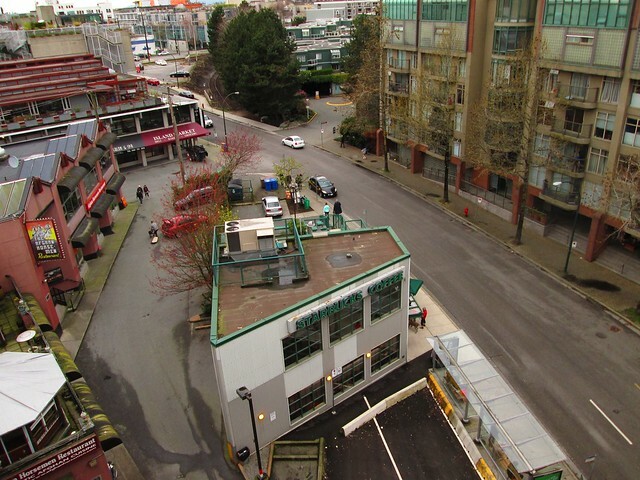 One of the features of Granville Island is the large amount of space devoted to car parking. On a sunny weekend, the line-up of cars trying to get on to the Island backs up to the 2nd Avenue intersection and sometimes beyond. Traffic on Granville Island of course moves very slowly because of all the pedestrians, the service vehicles and all those people either hunting for a parking space or trying to get in or out of one. I think a pair of elevators either side of Granville Bridge with their own bus stops would be ideal to improve transit accessibility. I am not a great fan of the #50. 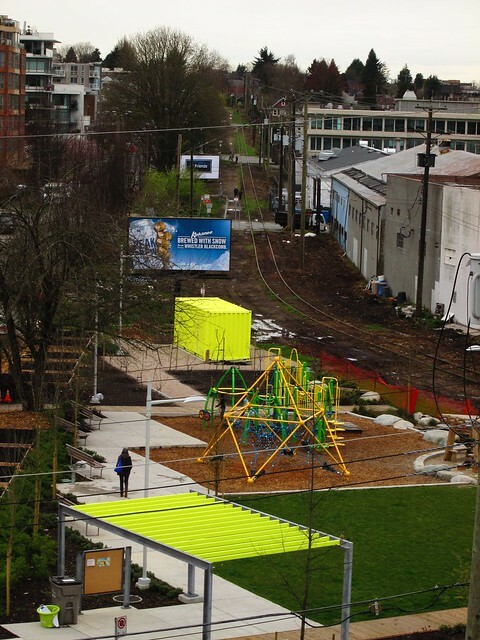 This shot down the length of the railway track next to 6th Avenue West illustrates my other great idea. The Fir Street Ramp could be taken away from cars altogether and repurposed for light rail/tram/streetcar – chose your own favourite term. As you can see the trains/interurbans had to climb from here to get up to Arbutus. The alignment could be used for a level rail structure that would connect onto Granville Bridge. 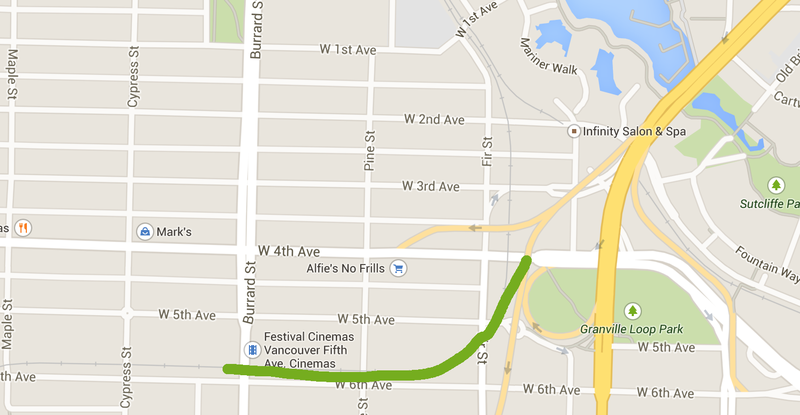 That also allows for grade separation of the crossing of Burrard Street. On Granville Bridge the line would use those two centre lanes with a straight shot off the Bridge to the Granville Mall (does anyone still call it that) for transfers to the Canada Line, Expo Line, SeaBus and West Coast Express. The old CP Arbutus right of way could be turned back into an interurban as a cheaper alternative than expanding the stations on the Canada Line. It could also connect to a future conversion of the little used CP tracks to New Westminster and Coquitlam, via Marine Drive Station and the new riverside developments. Why can’t we be like Zurich? I retweeted this video this morning and as I sat watching it, I kept thinking about that question. 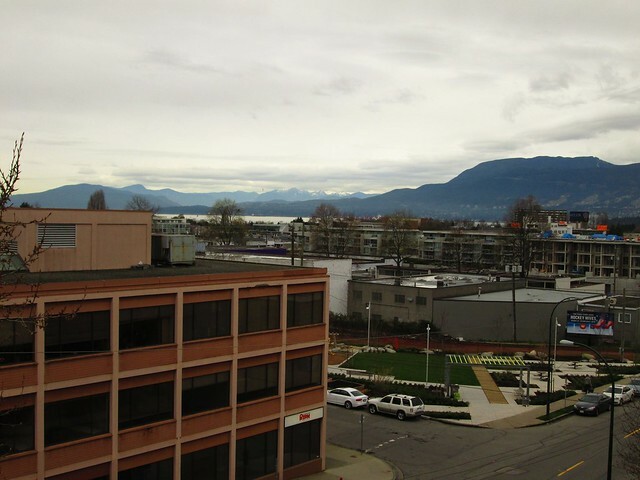 Or perhaps we just need to rephrase: when Vancouver grows up, it will be like Zurich. The bit of history that I think is important that is not mentioned in this video is about the trams. It is part of a European awakening. Cities like Amsterdam seriously considered replacing their trams (streetcars) with a subways. Others used a technique they called “pre-metro” to put the trams underground in city centres. And of course what happened in every case was the traffic expanded to fill the space available. So they stopped doing that. Places like Strasbourg designed the trams to be a desirable part of the city, not just a regrettable necessity. There is a lot about public transport in North America that reminds me of other public conveniences. The same thing also happened in Toronto. When the Yonge Street subway opened, traffic in the City Centre increased because there were no longer streetcars on Yonge getting in the way of the cars. It might be significant that Toronto still has streetcars. It is also very significant that while the planners (transportation, urban and regional) all now think in terms of surface LRT, Rob Ford wanted a subway. Some people have even referred to the referendum as Vancouver’s Rob Ford moment. And even Daryl dela Cruz is convinced that the choice of LRT for Surrey is increasing the No vote there. In Zurich they did plan on a subway system. But the costs were astronomical. And they already had a tram network as well as really good railways, which provided both suburban and intercity services. The Swiss are very well off, of course, and Zurich is the centre of financial services. But they are also very keen on democracy and civic minded. An American in that video almost cannot believe that government can be genuinely concerned about people. I have often thought that the reason we like SkyTrain so much here is that it keeps the transit out of the way of the cars. An elevated structure does provide a more attractive ride than a tunnel – and is considerably cheaper. But it also has an impact on area through which it runs. Not as horrible as the old elevated railways – which may have been taken down in Manhattan but are still the dominant mode of the New York subway in the other boros. I wonder if in some future Vancouver, having finally got up the courage to rip down the viaducts we will start planning to get rid of the SkyTrain structures. Or perhaps turning them into High Line style parks. SkyTrain of course has to grade separated because of the LIM rail. The British method of light rail is to use old railway lines wherever possible, but on street running in town centres. 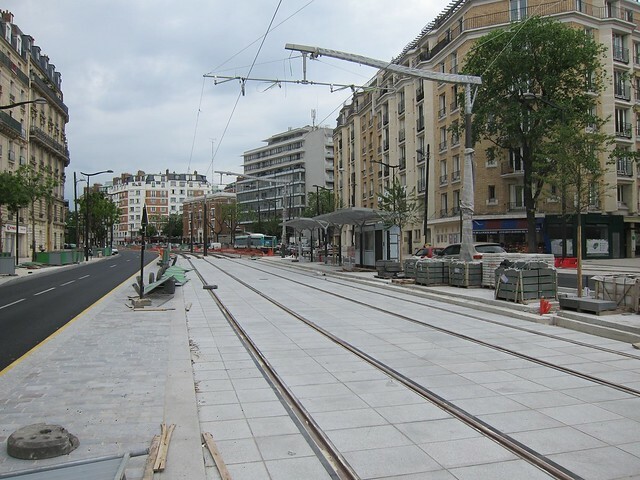 In Paris even though there is a disused Petite Ceinture railway line parallel to its route – grade separated at street crossings – the new T3 runs in the centre of the boulevard. The “art of insertion” is actually just removing space that is now taken by cars (moving and parked) and replacing it with people. Lots of people. Here we seem to be much less concerned about people. 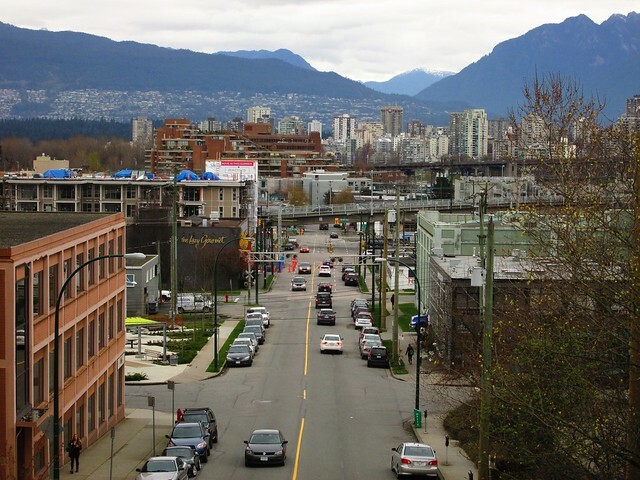 The Cambie Street line had to be underground because the City had designated much of the route as The Heritage Boulevard. A broad strip of grass with some large trees. Not actually usable. No one plays on it, or sits watching the cars speed by. There are no couples strolling hand in hand on those lawns. 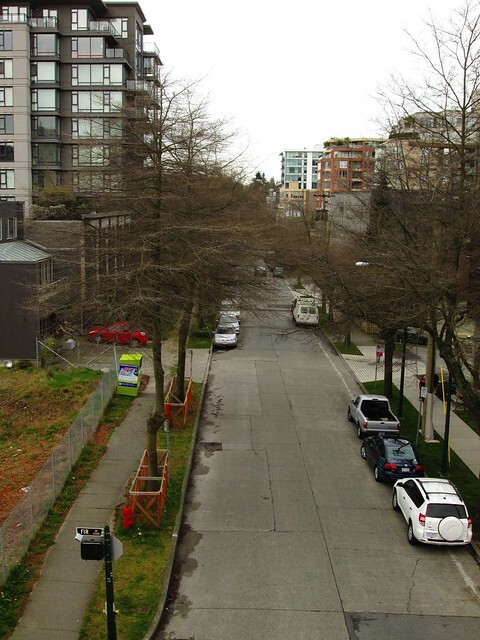 Cutting down trees for a transit line – or widening the Stanley Park causeway – is a red flag. Oddly, not for wider sidewalks and bike lanes apparently. The other thing I noticed about Zurich’s city centre was the absence of towers. This is also common in much of Europe. In cities like Rome or Florence the centro storico is four to six stories maximum. Unless it’s a cathedral or something. Paris does have towers – but only one at Montparnasse which is widely derided or clustered in La Defense (which is the location for shooting dystopian SF films). You will also note that the film concentrates on the decisions to limit parking and the volume of traffic allowed into the centre. One other thing that needs to be said too is that the Swiss are very particular about who they let in to live there. I haven’t looked but it seems to me highly unlikely that the Zurich region is planning on absorbing another million people in the next thirty to forty years. Haven’t I written all this before? The title comes from an article in The Economist (paywalled) which discusses the work of a graduate student who has challenged the very successful book by Thomas Piketty “Capital in the 21st Century”. I have had to return the copy that I was reading to the library: the wait list is long and the number of copies limited. If you want a good summary then Cory Doctorow has done a very good job of that. 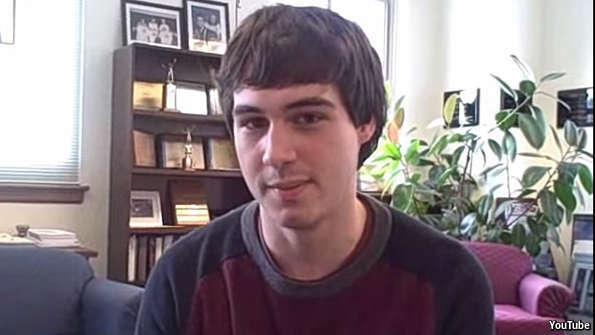 On March 20th Matthew Rognlie (pictured), a 26-year-old graduate student at the Massachusetts Institute of Technology, presented a new paper at the Brookings Papers on Economic Activity. Although the paper began its life as a 459-word online blog post comment, several reputable economists regard it as the most serious and substantive critique that Mr Piketty’s work has yet faced. And the same thing in almost any city that imposes an urban growth boundary to limit sprawl. Dr. Shlomo Ange of the Stern School of Business (NYU) Urban Expansion Project puts the issue simply in his introduction:where expansion is effectively contained by draconian laws, it typically results in land supply bottlenecks that render housing unaffordable to the great majority of residents. The Economist of course does not have to reference these reports since, as we learned recently, the marketplace of ideas has adopted this notion unquestioningly. Or has it? The argument stems from the idea that markets are better at determining everything than policy makers. Except that markets can only determine the level of use of those things that are priced. And most of the things that are of real value – breathable air and clean water for instance – are not priced. Land capable of producing food is priced far below what it would be as land designated as suitable for development. Smart Growth seeks to protect this land from development by ensuring that land within the growth boundary is better utilized. In fact the very idea of “affordable housing” might be misleading because it fails to encompass travel costs. Indeed the old saw about buying a house was “drive until you qualify”. The amount you can borrow to buy a house is controlled (in our case by the rules of CHMC) but no-one controls the amount of time and money you spend commuting. This idea is encapsulated neatly in the last of those bullet points. 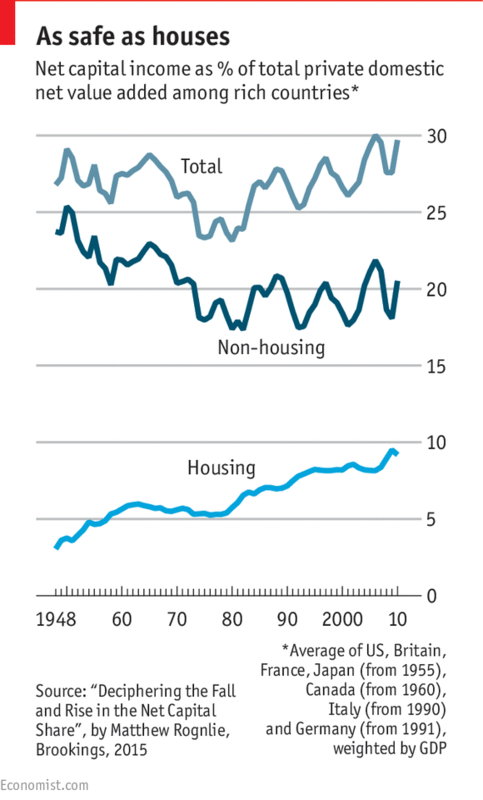 It is also the case, of course, that in markets like Vancouver, many people cannot afford to buy and renting is increasing in popularity even if the supply of rental housing may not be responding as we might like. It also ignores all the evidence that the conventional model is unsustainable. All the infrastructure that is needed to support sprawl makes it financially unaffordable – as Charles Marohn admirably demonstrates at Strong Towns. The US congress has been arguing for years how to patch up the crumbling interstate system, given their refusal to even contemplate raising the gas tax which funded its construction but not its maintenance. And the bits which are usable fill with traffic congestion which building more roads has never relieved. This makes for very unhappy commutes (see Charles Montgomery “The Happy City”) but again human happiness is another one of those externalities which markets ignore. Prices were supposed to be based on “utility” but every study shows that simply piling up more cash fails to make anyone happy. Indeed the greatest failing is that the inequality puts more resources in the hands of those who pay politicians to adopt policies that are disastrous to human existence but are good for their short term profit. What bothers me about the Economist piece is the nonchalance which goes along with omniscience. It goes without qualification what policy makers must do. Because all we are talking about is inequality and where wealth comes from. So none of those dull externalities need get considered at all. And all of this it seems to me has been covered by others more able and capable than I, but that work does not seem to get cited when I go looking for it. I am actually not too dissatisfied by this piece, but at one stage I was seriously considering crowdsourcing it. 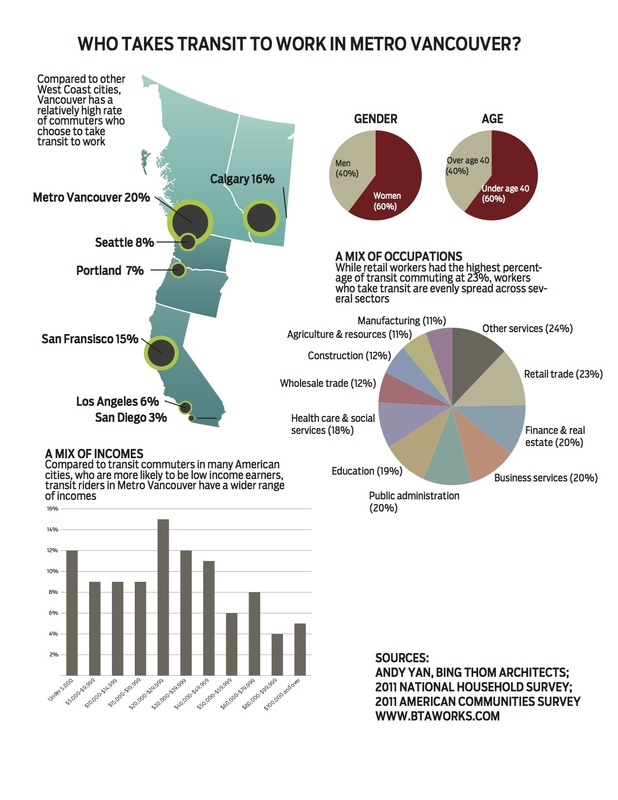 I am sure that my regular crew of commentators will be piling in but if you know of other articles which deal with this particular debate (“the impact of growth control on housing affordability” gets 54,700 hits) in particular with reference to either this region or the Pacific North West, by all means let me know. Of course, there is a policy that could deal effectively with affordability, just as there is a policy that would end Homelessness. It simply requires the provision of subsidised housing. Of course those who oppose taxes on the wealthy will howl with rage. But all that we have to do to free up some resources is stop subsidizing fossil fuels – and rethink our agricultural subsidies too, while we are at it. It is ridiculous that corn and sugar production is subsidized when we are dying from diabetes, obesity and heart disease. All of which are also strongly associated with sprawl. Utah – hardly a radical liberal sort of state – eliminated homelessness by simply housing the homeless, which turned out to be cheaper than making them stay on the streets. Maria Harris is the Director Metro Vancouver Electoral Area A and thus a Member of the Mayors’ Council on Regional Transportation. She wrote to me to tell of her creation of a list of Frequently Asked Questions – and of course – the answers. These are very thorough and objective. They are currently available as PDF File and will be available as a web page shortly. She writes “I intend to update the FAQs if there are more questions that should be answered or if any of the answers need to be modified based on feedback I receive.” As you can probably tell, I have not yet sent any feedback but when I do it will be very brief. I am very impressed, and reading through her answers there was nothing that caused any surprise or instant urge to suggest a correction. Which is something of an unusual experience in general and especially in connection with the current plebiscite. I wish I felt that people have generally open minds on this issue, and are seriously seeking out advice. I find it somewhat distressing to see reports of ballots being discarded in the recycling bin of apartment buildings, though these may simply be a reflection of the mobility of the population and their refusal to pay Canada Post to forward their mail. The least likely to look at the FAQs as a source of information are those who have already made their minds up based on the propaganda of the No side, who seem to be utterly impervious to either reason or good quality data. However if you know one of these rare people who actually do need one of these questions answered – or can suggest one that needs to be added – please click that link in the first paragraph. It cites my analysis in “Eleven Reasons to Support Vancouver’s Transportation Tas” (http://www.vtpi.org/VanTransitTax.pdf ), and includes criticisms of our analysis from Jordan Bateman. Bateman’s comments suggest that he does not understand urban transportation statistical analysis. TransLink trip diary surveys (http://bit.ly/1DGfajZ ) report mode share for TOTAL trips, Census data shows mode share for COMMUTE trips, which generally have higher transit shares. Since regional travel surveys are not standardized between cities and are performed infrequently, that are unsuited for comparing cities. In contrast, Census data are collected using standardized methods, so even if there is bias (for example, because the long-form is voluntary), the biases should be similar between regions so the results are comparable. Commute mode share is a very useful indicator because it is one of the few transportation statistics that are collected around the world. We can therefore be confident that Vancouver has relatively high and growing walking, cycling and public transit mode shares compared with peer cities even if we are not sure their exact magnitude. These positive trends are also evidence from other data, such as declining downtown vehicle ownership and total trip generation rates. Cost-efficiency and mode share are what experts call “output” indicators, that is, they reflect the efficiency of a particular step in the system. Even more important are “outcome” indicators which reflect how well the system actually performs with respect to community goals. Vancouver fares particularly well with regard to two very important outcomes: Vancouver has one of the lowest per capita traffic fatality rates (considering walking, cycling, bus and automobile crash deaths), and its households devote a smaller portion of their total budgets to transportation than any other large Canadian city, as indicated in the revised version of my report. This suggests that the region’s efforts to improve and encourage walking, cycling and public transit are having positive effects and providing savings and benefits to residents and local businesses.